...if you think your friends are the kind of people who will be impressed by a well-prepared onion. Regardless of what your friends think, as an example, I'll be showing you later how to properly dice one. 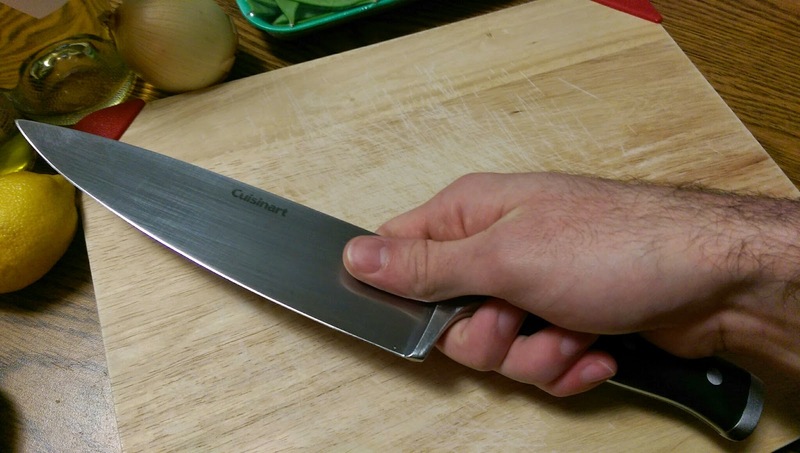 The chef's knife is one of the largest knives you will use in the kitchen; it might actually be the largest. Not to worry, though. Its size increases its force and stability. So, for those reasons, it's no wonder its the most versatile player in the kitchen. 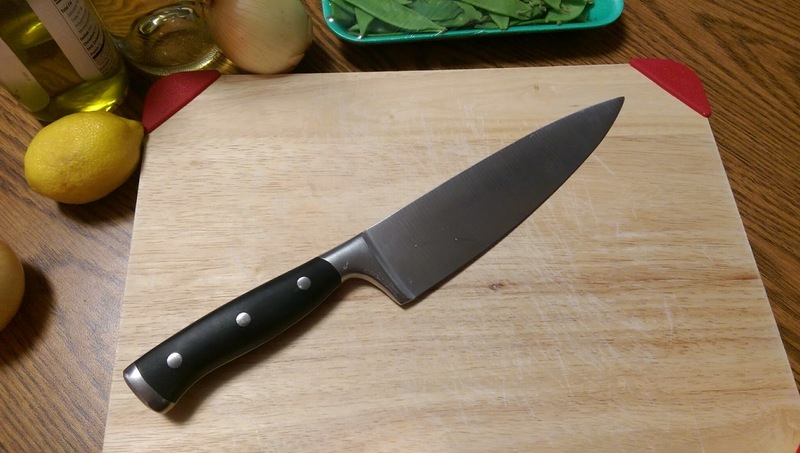 This knife usually comes included in a set of three knives, with the other two being a paring knife and a serrated knife. I think I got a set for around $30. is not ideal. The grip is uncomfortable and inefficient. Holding it like a club is no good either. 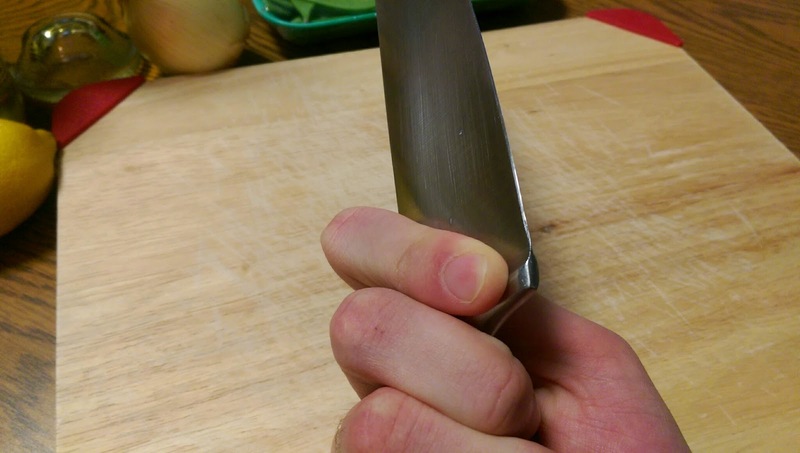 The proper way to hold a chef's knife is not by implementing a Cro-Magnon baseball bat death grip, but by pinching the hilt of the blade with your thumb and index finger, and wrapping your other fingers around the handle. 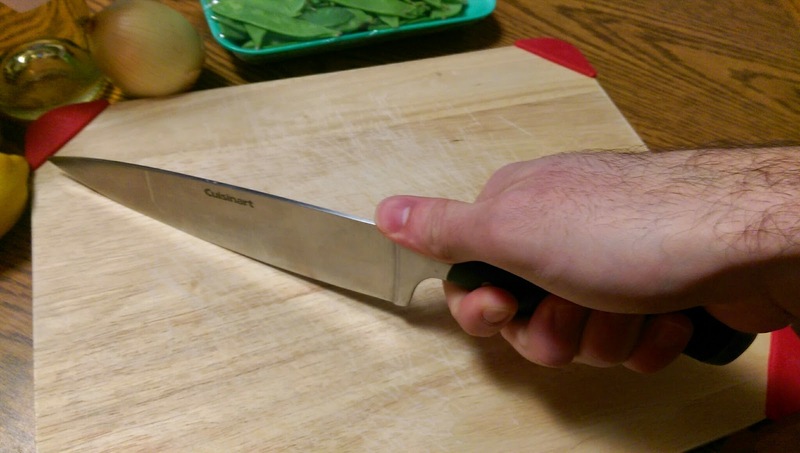 Holding it this way allows you to move the knife in a smooth cyclical motion when chopping up stuff. 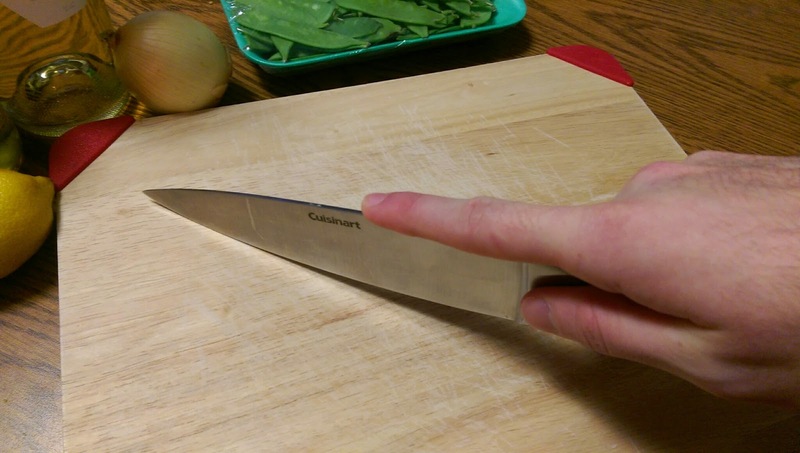 It also gets your finger down from the top of the knife, where it would be at risk for slipping. As I said, the knife should move in a sort of rocking, cyclical motion on the cutting board. You should never have to bring the tip of the knife into the air, but instead continually raise and lower the hilt of the knife as if there were a hinge near its tip. Once you try it and get the motion going, you'll instantly feel like a chef. Sorry - a cook. Well, however it makes you feel! It's seriously so much easier to use a chef's knife this way. Now, as for what you will be cutting on, try to find a good, sturdy wooden cutting board. Wood treats the blades nicely so they don't dull as fast. It doesn't have to be a huge chef's block, and not a tiny one either, but one of moderate size will do. However, you may want to purchase a smaller one in addition if you will be solely relying on yourself for all your meals and snacks. You don't want to always be washing the big one if all you're cutting up is an apple for yourself. If you're going to be cutting raw meat, buy a plastic one too. Wood is porous and absorbs things like salmonella (aww, man) from raw chicken, and washing the board may not release those ugly salmonella guys. Subsequently, you don't want to make a fruit salad on the same cutting board you just used to cut that salmonella chicken, even after you've washed it. So, buy a plastic one, label it "RAW MEAT ONLY" with your boldest Sharpie, and keep it separate from the wood. And always cook your meat through! Check out the next entry to see me dice an onion: one of the most fundamental skills used in the kitchen.